HASSLE FREE LED HEADLIGHTS - Patented full aero-grade aluminum alloy unibody construction ensure the tactical headlamp is sturdy and durable while provides better cooling and IPX 6 waterproof ensures protection against spraying water from any angle. SUPER BRIGHT BEAM - This super bright headlamp utilize CREE XP-G2 S3 LED that maximum output can reach 500 Lumens and the beam distance is up to 270 yards even it is in pitch dark.Ultra low-Low-Middle-High and Strobe five modes provided for you. NO LONGER NEED BATTERY - The usb headlamp comes with 18650 battery which is rechargeable by USB cord and take 4 hours to fully charge. Meanwhile,cree headlamp maximum runtime is up to 80 hours in ultra low setting.Please remove the insulation film before using. HEADLAMP is ALSO a BIKE LIGHT - More than a Camping headlamp. Featured standard PTZ and bicycle light holder,it can be used as a bike light. A pivot mount that makes you to adjust your bicycle headlamp up and down to 120 degrees in the direction you want. 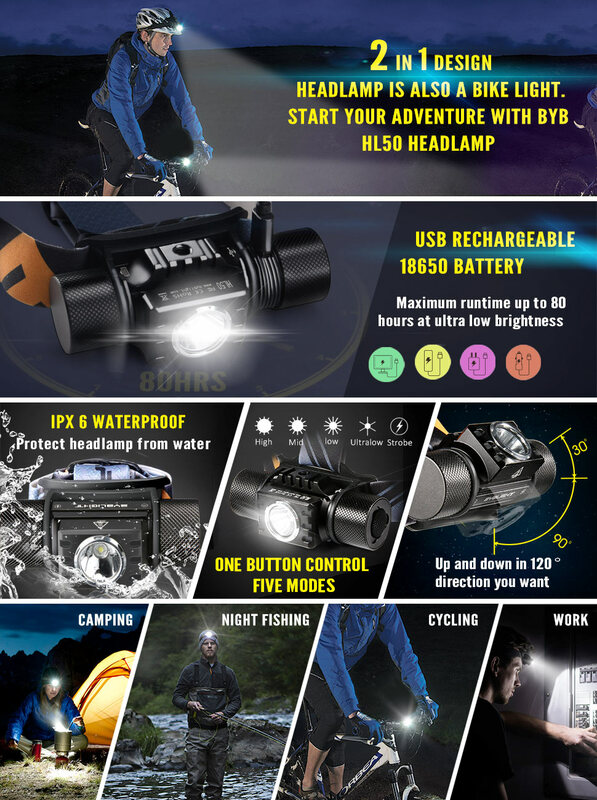 HIGH COST PERFORMANCE - Comparing with same design led headlamp in market, you will save almost a half of budget then get a waterproof headlamp with more than 80% of similar User experience.A perfect gift for family or friends. Whether you’re setting up your tent at night, trail running at dusk, or just looking for something in your attic, you can’t beat the hands-free lighting convenience offered by a headlamp. Now, you should keep this Well-designed, Well-built, Functional and Comfortable BYBLIGHT HL50 in hand and peace of mind. Main body is made of a single piece of aero-grade aluminum alloy.Standard PTZ featured bike light holder make it can be used as bike light. Utilize Cree XP-G2 S3 LED provides maximum output 500 lumens. Rechargeable 18650 battery support working for up to 80 hours runtime. Enjoy using the headlamp during hiking,camping,running fishing or walking dog.Even professional fields like construction,digging coal. Power cut,auto repair,home security or other emergency,BYB can also be your best companion and provide great assistance for you. Adjustable elastic headband can wear on hard hat and fit any head size. A rubber pad also as pivot mount on your forehead to prevent heat. Rotation up and down 120 degrees preventing illumination dead zone.Five modes brightness setting controlled by one single button. Integrated high efficiency circuit provide constant current circuit design. While charging,indicator shines red and fully charge is green. When power of light lower 2.7V light will strobe twice per about 60s,less than 2.5V it will automatically stop working to protect battery.